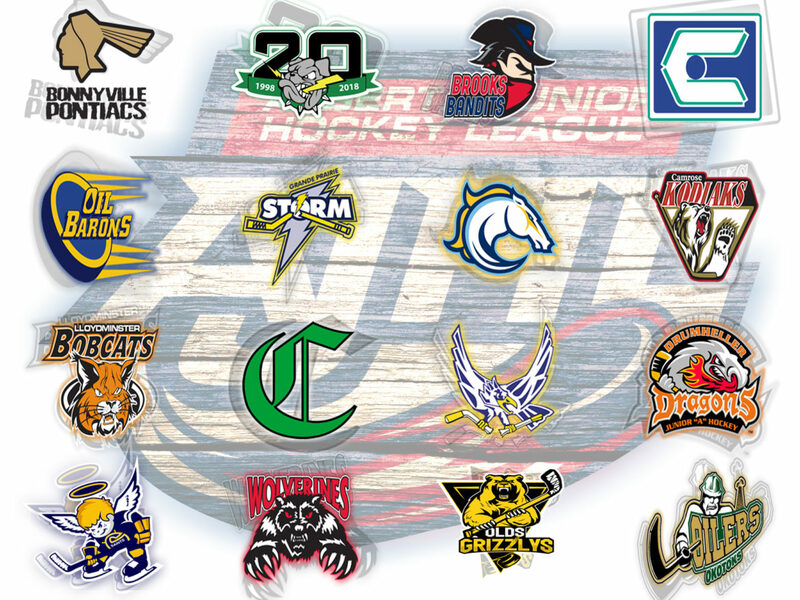 It was another busy week in the AJHL as there were a few trades, along with a couple teams making some additions, some university commits, and even a new uniform reveal! The Pontiacs got themselves a new identity this past Wednesday with the unveiling of their new jerseys. Tweet us and tell us what you think of their new look. Andrew Marshall has officially committed to the University of Nevada-Las Vegas of the ACHA. Marshall had a career year with the Canucks in 2018 with his 29 points (10 goals, 19 assists) in 55 contests. He played in 165 AJHL career games – all with Canucks – and is joining for AJHL and Sherwood Park Crusaders star defenceman Chase Torontow in Las Vegas. We saw Jake Ashton be traded from the Olds Grizzlys to the Spruce Grove Saints, last week, with no explanation on how Ashton became a Grizzly in the first place. On Monday afternoon all was put to rest when the Eagles announced the acquisition of 00 D Jared Bowman from Olds in exchange for Ashton. Bowman is heading into his third year of junior hockey and has already played in 110 games scoring 35 points (7 goals, 28 assists). His first two years were both spent with the Olds Grizzlys. 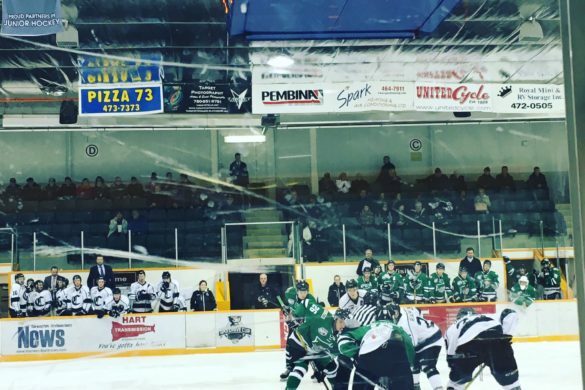 It’s clear that the Eagles are looking to improve on the defensive side of the game with Bowman being the third defenceman acquired this offseason along with Mark Dohan (Calgary Canucks) and Aidan West (St Albert MAAA Raiders). A solid strategy considering they allowed 233 goals last season which was 34 more (199) than the year prior. On Friday it was announced that Zach Carlson, a St. Albert native, committed to playing with the Eagles for the 2018-19 season. Carlson came up with the St.Albert AAA Raiders in Midget and now at 6’0″ and 180 lbs he looks to contribute in the AJHL as a two-way player. He scored 7 goals and 12 assists in 33 games with the Raiders. He brings decent size and speed to the Eagles forward group in camp. The Thunder had a busy week bringing in two fresh new faces while moving out a couple of key contributors. First out the door was Sherbrooke, Quebec, native Felix Meunier who moved an hour up the road to the Whitecourt Wolverines. Although he wasn’t with the Thunder long, playing on 15 games, Meunier made an immediate impact with his old club scoring 21 points which included four three-point nights. In return, Drayton acquired 98 D Tanner Foster which came as somewhat of a surprise after the great season he had in 2018. 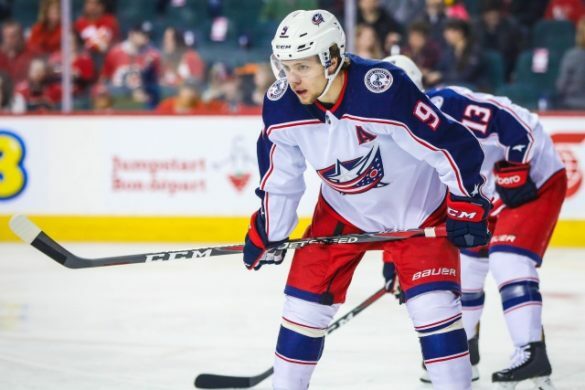 Foster finished as the teams highest scoring defenseman with 29 points (4 goals, 25 assists) and saw his point total increase by 11 points from the year prior. The move does open up a 20-year old slot for the Wolverines who now have 4 20’s on their roster – Ryan Grant, Matthew Monk, Ben Evanish, and Jaedon Leslies (via team website). Just a couple of days later, Trevor Ayre was on the move back to the BCHL after he was traded to the Penticton Vees for 00 F Tanner Hopps and future considerations. Ayre came over from the Langley Rivermen in late November to join the Thunder and, much like Meunier, made an immediate impact on the team. He helped make their offence a legitimate threat when coming down the ice and became one of the leagues best goalscorers. 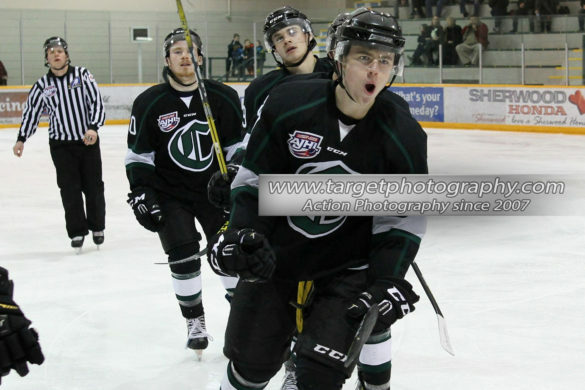 In 45 games with Drayton Valley, he scored 50 points (24 goals, 26 assists) and had nine powerplay goals to his name. However, Ayre wasn’t with the Vees long before being moved back to the Riverman. As mentioned, Hopps was the player coming the other way via the trade. It’ll be interesting to see if he commits to joining the Thunder as we have already seen it be a struggle for AJHL teams to bring in players from the BCHL – the best case of that being the Bonnyville Pontiacs. With Riley Morris leaving for college next season (Mount Royal), the Okotoks Oilers went out and got themselves a veteran goaltender in Nolan Hildebrand from the Penticton Vees. Hildebrand, who severed as a backup for the past two seasons, played some of his best hockey in 2018 with his 2.42 GAA and a 0.910 SV%. Along with that, he recorded 11 wins with only three losses. 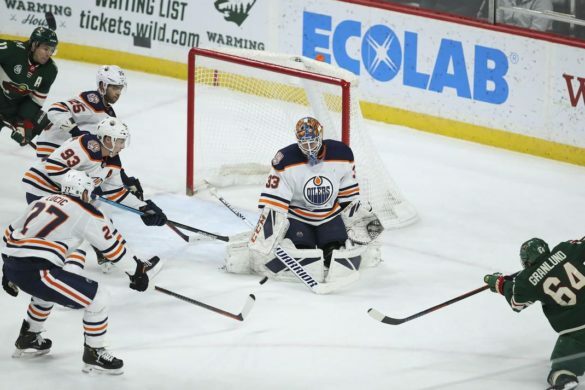 With Ben Howard returning to Okotoks, it’s looking like the Oilers will have one of the best goaltending duos in the AJHL once again. Other news coming out of Oil Country involves Wisconsin commit Dylan Holloway. Once again, Holloway will be wearing the Maple Leaf after being selected to play in the U18 Ivan Hlinka Gretzky Cup this August. This isn’t the first time the Oilers star has represented Team Canada on a world stage. Last season, Holloway played in both the U17 World Championships were he won the silver, and also the World Junior A Challenge where he left with a gold medal around his neck. Best of luck to Holloway, and the rest of Team Canada! Friday morning the team announced the recruitment of 2000-born forward Alex Nordstrom. Nordstrom hails from Michigan where he played for his high school team the Hancock Central High Bulldogs. In his junior season with the Bulldogs Nordstrom played in 25 games and totalled 33 goals and 28 assists. He is the all-time leading scorer for Hancock Central High with 170 points in 80 career games. He was also named a 2018 All-State All-Star forward. On Saturday it was announced that the Saints traded their CJHL rights of defensemen Tyler Pang and goalie Hayden Missler to the West Kelowna Warriors of the BCHL for ’98 born D-man Cory Babichuk and a PDF. Pang was just recently acquired in late July from the Olds Grizzlys. Before that he was acquired by Olds from Sherwood Park in January. 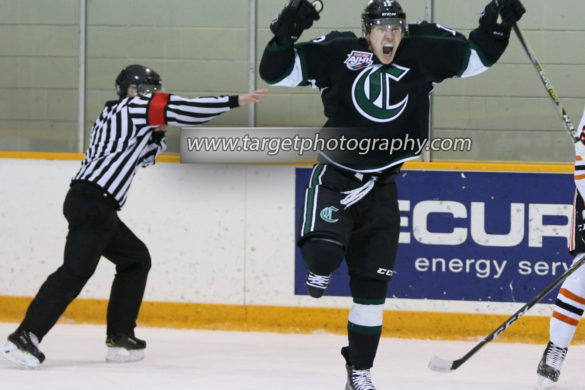 In 26 games with the Crusaders Pang totalled 24 points (8G-16A). With Olds he played in 16 games netting only 8 assists. Missler the 99′ born goaltender, played in 21 games with the Saints where he put up a 2.44 GAA and a .902 SV% on his way to becoming an AJHL Champion this past season. Coming back the other way is Babichuk, who played in 18 games with the Surrey Eagles of the BCHL where he put up 9 points (1G-8A). He was sent to West Kelowna in mid-July before now being traded to the Saints, who get a left-handed D-man who is smaller at 5’10 and 172 lbs. The Bandits lost a forward Sunday with centre Mack Hancock committing to the NCAA Division 1 University of Alaska-Anchorage. The ’99-born forward is a 6’2″ 185 lbs centre who played in 16 games for the Bandits last season scoring 1 goal an 9 assists. He is the 13th player from their 2017-18 season that has committed to a Division 1 school.